Recently I read one very interesting and useful e-book related to Search Engine Optimization. This really help me to learn a lot of concept about SEO. And also the tips are very useful to increase search engine ranking of your website. So here I am sharing the content of that e-book with you all. Hopefully this will also help you to increase your knowledge in Search Engine Optimization. This is the Part 4 of 4 articles – Sitemaps. We strongly recommend that you build a site map in XML as outlined on www.sitemaps.org. This is one of the few initiatives where Google, Microsoft and Yahoo have all agreed to a common file format that all search engines will use: robot.txt format. All three search engines use this map to crawl your sites. It requires that your site is set up and created in such a way that every time a page is removed, changed, or deleted, the XML sitemap is updated. 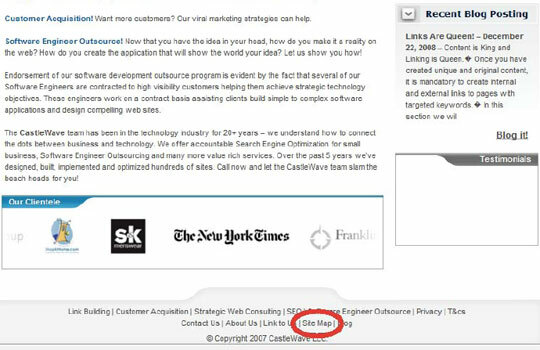 You will find specific examples on how to implement this at www.sitemap.org. It is also possible to manually submit all of your pages to Google via the webmaster tools. For complete instructions in how to submit site maps to Google, Yahoo!, and Bing go to the addresses provided below. Sitemaps are particularly beneficial when users can’t reach all areas of a website through a browseable interface. (Generally, this is when users are unable to reach certain pages or regions of a site by following links). For example, any site where certain pages are only accessible via a search form would benefit from creating a Sitemap and submitting it to search engines. This document describes the formats for Sitemap files and also explains where you should post your Sitemap files so that search engines can retrieve them. Please note that the Sitemap Protocol supplements, but does not replace, the crawl-based mechanisms that search engines already use to discover URLs. By submitting a Sitemap (or Sitemaps) to a search engine, you will help that engine’s crawlers to do a better job of crawling your site. Google Webmaster tools is chuck full of handy items and information. The following is an example from the Google webmaster tool of an XML sitemap. The Sitemap in the example contains a small number of URLs, each of which is identified using the XML tag. In this example, a different set of optional parameters has been provided for each URL. Don’t confuse the above instruction with having a Site Map page on your site. You should create a page on your site that is called “Site Map”. We typically place the link to the site map in the footer menu – but you are welcome to place the link wherever you like on your site. The site map page helps your customers navigate the site more easily. It also provides opportunity for internal linking on your site (see Links Are Queen). The site map that appears to the customers coming to your site will look something like the site map below. Customers who go to this page may click on each entry in the Site Map and link directly to the page represented. 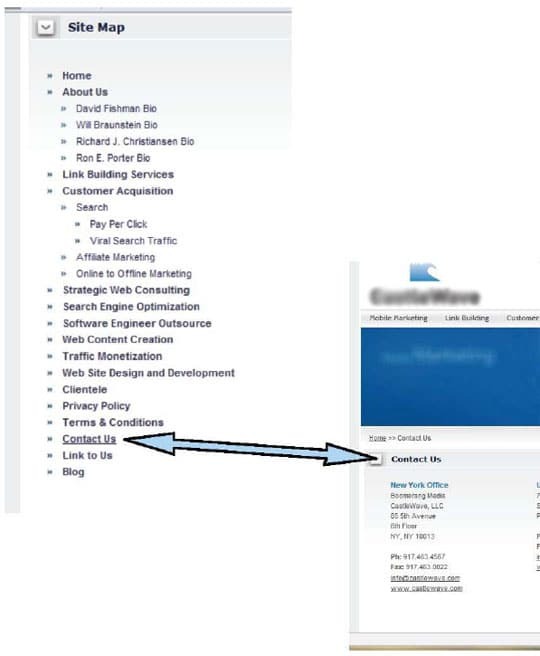 By clicking on Contact Us the user goes directly from the site map page to the Contact Us page. Thank for sharing about SEO. Nice share. Thanks for this articles. Tumb Up! Hi, I like your site and the Joomla plugin. Your site is broken in all browsers except Opera. The templates are not appearing correctly, so it is just showing up as an unformatted HTML page. It is displaying correctly in Opera and IE now. Firefox and Chrome still are not picking up your template CSS correctly. I even cleared the cache in the later two browsers, they are still just showing unformatted HTML. At least not for me, just an FYI. Hi Shane, Can you please review the website once? We just disable some compressor plugin. Thanks for your help. It is working as designed now and looks good in all browsers.